In keeping with their Big Push, Google released a new version of Gmail with a major facelift, as well as released — and then pulled — their long-awaited native Gmail app for iOS. 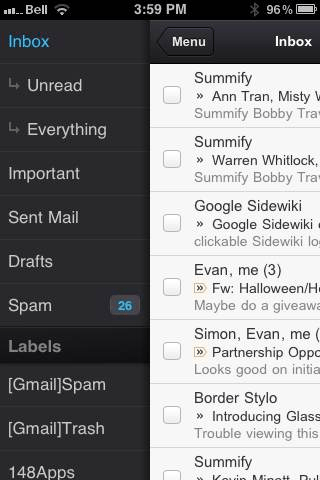 The new Gmail look, as is to be expected, has a few minor annoyances to accompany some great new features, and the app is actually very cool, but was pulled due to a notification system problem. Check out the feature-list for both below. The new web app has a look and feel that fits in with Google’s updated branding. 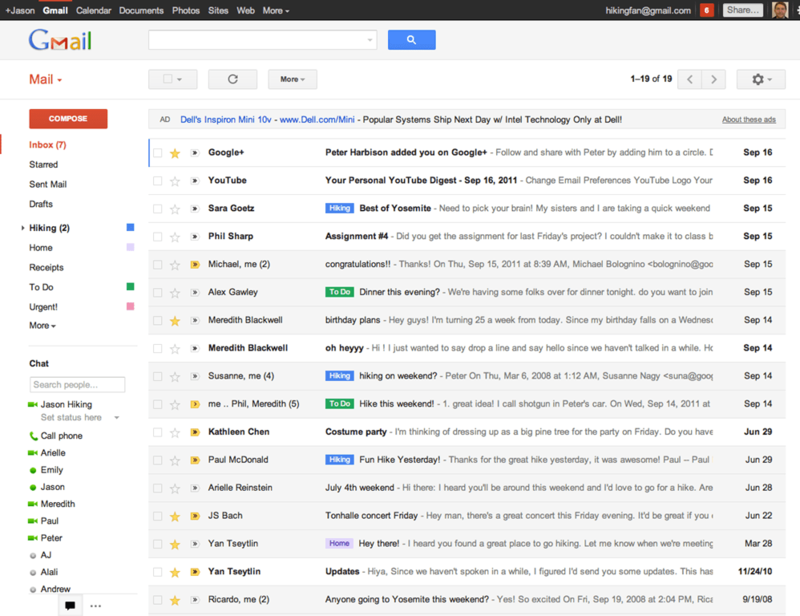 It’s “cleaner, more modern” and is very similar to the preview theme that the Gmail team released a while back. I’ve been using that theme for a few months and I love it, but I’m not terribly fond of the dynamic “Display Density” feature. Display Density allows you to control the default amount of whitespace for each email message in your inbox (Comfortable, Cozy, or Compact), but whill actually change dynamically depending on the size of your browser window. This may seem like a good idea, but if you use Minimal Wall’s guidelines for window sizes, it displays as Compact, no matter what, which clashes with your zen by slapping you about with tiny little squished up emails. Google should add a feature that allows you to force the display of your favourite Density, no matter the size of your window. 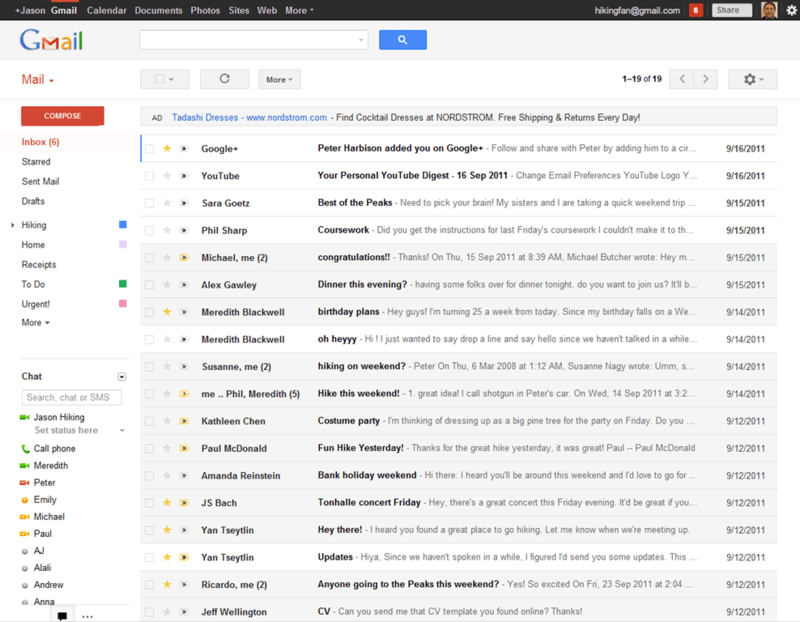 What is awesome about the new Gmail is the sweet new toolbar, the much-improved search dialogue — I always hated the in-field search commands — new themes, and the improved look of threaded conversations. I also like the additional control settings, the ability to drag the size of the chat window, and the awesome little buttons in the sidebar that can make the chat, gadgets, and other annoying sidebar items vanish until you want them. Once Google gets a handle on the notifications errors (apparently just a silly little mistake on their part, so it shouldn’t be long), the new iOS app will probably kill the iOS mail app for me. I only use the thing because I hate waiting for Safari to load, and the new app looks like it will finally allow me to do what I’ve always wanted to from my iPhone and iPad: reply to emails with the email address that they were sent to. This is a huge deal for me, because I use a multitude of different email addresses for different things, and they all come through Gmail. I don’t necessarily want to answer my 40Tech email or my work email with my main email address, which I’ve had forever, but might not always come off with the… professionalism… I need. 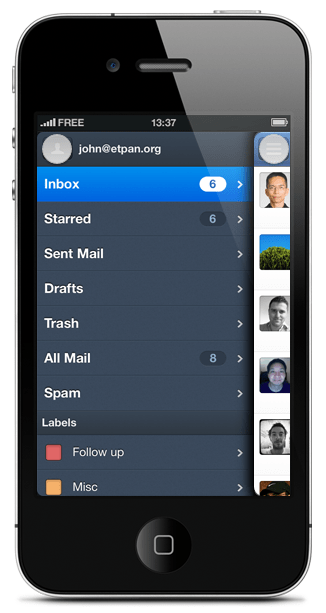 Unfortunately, you still can’t compose new email in the app and choose what email you want to send from. 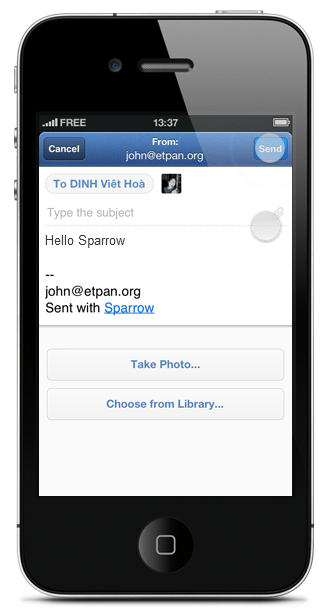 Baby steps, though, I suppose — and it’s still better than the iOS emai app. 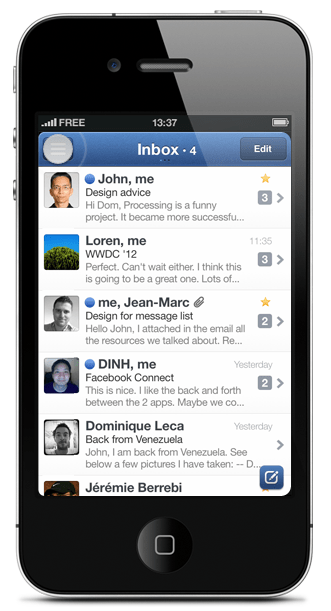 The new Gmail for iOS app is nearly a full-featured Gmail experience. There is universal search, auto-complete from both Gmail contacts and iPhone addressbook, attachment upload (which is basically photos, of course), threaded conversations, priority inbox, easy archiving, labelling, starring, deleting, and spam reporting. 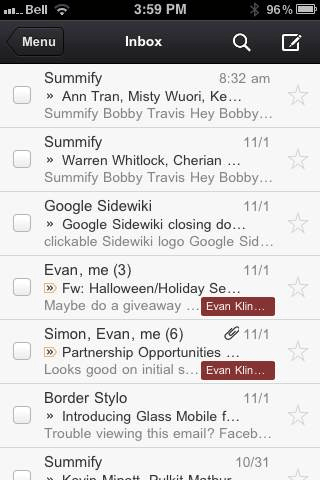 On iPhone/iPod Touch, the Gmail app gets out of its own way, focusing on the content, with a nice expandable sidebar to sort through your labels. 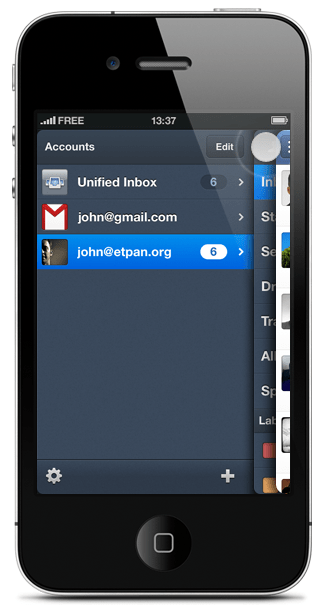 On the iPad, you get the standard two-paned view, which makes for easy viewing and navigating on the larger screen. The only other things to note are that, at the moment, the app doesn’t have offline support, and doesn’t do multiple Gmail accounts, and that swipe gestures — while good for the most part — sometimes feel a bit awkward. 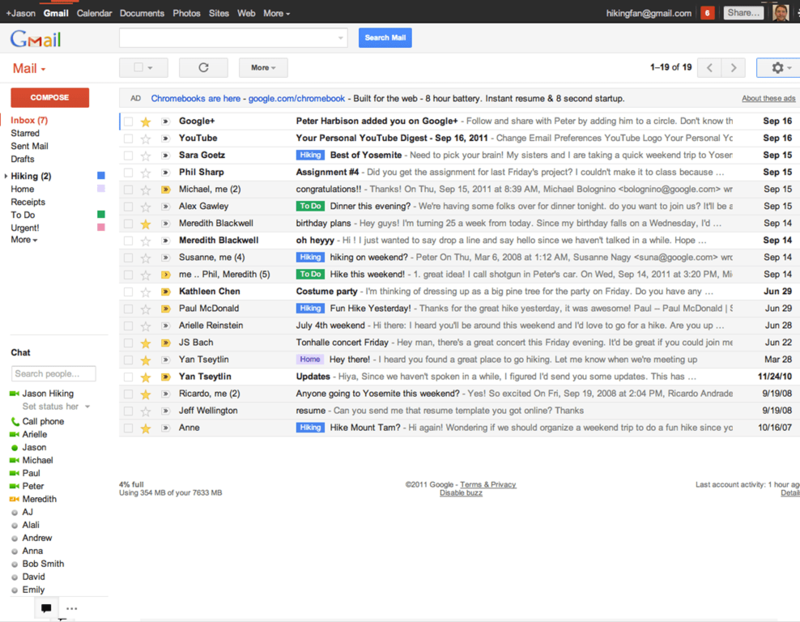 What are your thoughts on the new look for Gmail? And when you get a chance to check it out, tell us what you think of the iOS app, as well! Google officially announced the retirement of the Gmail-integrated Buzz on October 14th, but some of you may only now be getting the little pop-up notification in your Inbox. I got mine yesterday and I realized that, in a weird way, I’ll miss the service. It seemed like it had so much potential, at first. We even wrote about why we figured it wouldn’t flop – oh, wait… that was Wave. What can I say… we’re optimists. In any case, the integration of Buzz was handled badly, the “bubble up” experience was annoying (to say the least), and the UI design was the former and most unfortunate Google Ugly. So, anyway… If you want to view or keep your Google Buzz content, you can still see it on your Google Profile, and you can download it via Google Takeout — a very handy service, I might add. On a final note, does anyone else find it funny that the “Google Buzz is going away…” post in the Big G’s Gmail Help pages can be actually shared on Buzz — and that there is a button to open up Sidewiki as well? Just me…? Say your farewells to Buzz in the comments. Perhaps it is just a coincidence, but I’ve had a couple of people that I know who have had their email accounts hacked recently. Given all of the personal information we send and receive in email messages, that can be a traumatic experience. One victim wondered if she should take a scorched earth policy, and move completely to a new email account. That’s normally not necessary. If you still have access to your account, you can take some steps to secure it, and keep the slimy criminal out.